We will begin in production with our form next month. We suppose that we will have less than 100 submissions per month, but in order to have no problems, can we configure a "alert" in order that it sends us a mail when we reach 80 submissions ? Because if we reach 80 submissions, we want to pay in order that our formular won't be disable even 1 minute. - is it 100 submissions per formular ? - or 100 submissions per account ? To finish, I have reached 100 submission for the formular "xentive services", but it was only tests, can you re-initiate it only this time because it was only during the development phase ? There is already an automatic configuration set to send an alert when the account has received 80 submissions on the free plan. You can keep track of the usage from your account as well. The limit is 100 submissions monthly per account. 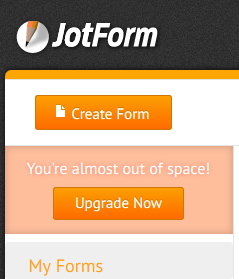 You'll need to upgrade or wait for the counter to reset on first of the next month once the forms get disabled after receiving 100 submissions. As per your request I've reset the counter and please be noted that it can be only once per account. Please do not hesitate to get in touch with us if you have any other questions. We are happy to assist you.